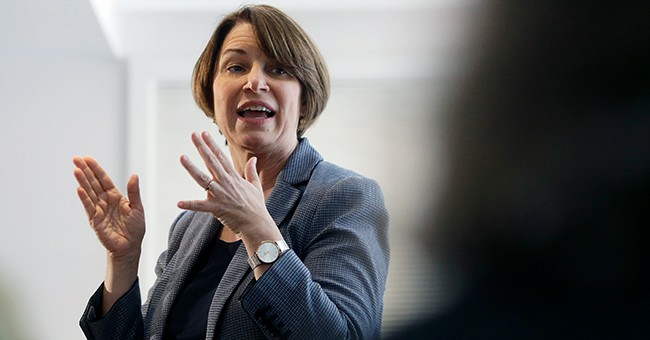 Sen. Amy Klobuchar (D-MN) claimed on CNN last weekend that in her eight years as the top prosecutor in Hennepin County, Minnesota, the incarceration rate for African-Americans decreased dramatically. "If you look at the data, you will see there was a 65 percent decrease in incarceration of African Americans when you go from the beginning of my term to the end,” Klobuchar told Jake Tapper on "State of the Union." She was citing statistics from the Vera Institute of Justice. But, it set off some fact checking alarms for the editors at The Washington Post. After a week of analysis, they found that Klobuchar was relying on some "bad data" to embellish her record. "The whole thing appeared to be too weird to be true," Glenn Kessler writes. "And it wasn’t true." That means "there was a 65 percent drop in a year — with no real improvement after that." The WaPo dug a little deeper, and reached out to Vera for more explanation. They reported back that, yes, something was off. "No meaningful statements about the number of black people in jail in Hennepin County can be made for the time Klobuchar was DA,” he noted. Klobuchar's campaign responded to WaPo's fact check to offer the following clarification. Still, how much credit she can take for that is debatable, as racial disparities remained "huge." As such, the WaPo gifted her Four Pinocchios. PolitiFact, who initially concluded Klobuchar's statement was "half true," switched to "false" after WaPo's reporting: "After this review, we concluded that the data for jails is too compromised for us to rely on it." Other reports have exposed how Klobuchar opted against charges in police-involved killings more than two dozen times. One of Klobuchar's 2020 rivals, Kamala Harris, is also in some hot water for her prosecutorial record. As a district attorney and then the state’s attorney general in California, she reportedly kept individuals facing wrongful convictions in jail and pushed for legislation to criminalize truancy and fine or incarcerate parents. Critics have used these and other of Harris's controversial decisions to point out she's not as "progressive" as she says.